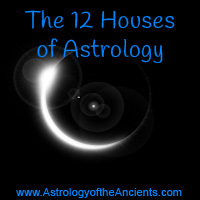 Astrology houses are one of the basic elements of an astrology chart. Combined with the planets and the signs, you have everything you need to read an astrology chart. While the planets reveal your motivation for doing things and the signs represent your attitude toward life, the astrology houses reveal the areas of your life in which everything is occurring. For example, you might have your Moon in Scorpio, indicating that you have powerful emotions and cause major transformations in your life and the lives of those around you. But it's the astrology house that reveals where this will take place. Will it be in your finances? your love life? Essentially the houses take the astrological explanation of your behavior and the events that happen in your life, to an understanding of the role you play in what is happening to and around you. No longer are you the person experiencing events. You are now the person causing the events to happen. When you understand the role that the astrology houses play in your chart, you have a deeper understanding of how to use astrology to foster personal growth and transformation. If there is an area of your life that is not what you would like it to be, a pattern that keeps reoccurring, or an obstacle you are facing, the astrology houses reveal how you have contributed to the problem, what you expect will happen, and what changes you can make to move closer to the results you seek. When this understanding is unlocked, you have the tools you need to change how you relate to money, to stop limiting yourself, and to allow more money to flow to you. Thus, you can think of the astrological houses as an instruction book for life. The Twelve Houses by Howard Sasportas – If you're looking for more information on astrology houses and how they effect different areas of your life, this is the book you want. Sasportas ranks among the best astrologers of all time and his book lives up to his reputation. It's perfect for beginners and intermediates looking to learn more about houses, aspects, moon nodes, Chiron, the planets, and more. There are numerous examples to help you understand how to put everything together.